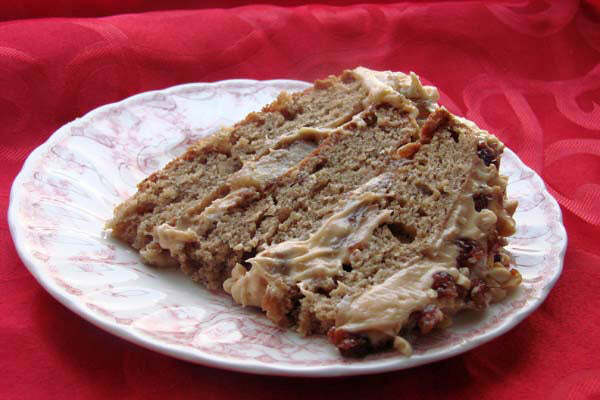 Peanut butter, honey, bananas, bourbon and bacon, an unorthodox combination, sure, but it makes for a cake fit for a king, specifically the King of Rock and Roll. I’ve been a fan of the Elvis sandwich–bananas, honey, peanut butter and bacon grilled on a sandwich since college when I first tried it at Peanut Butter and Co.’s sandwich shop in Greenwich Village. A couple of years ago, I decided to whip up some Elvis-inspired cupcakes in honor of my friend and fellow blogger, Rachel of Cupcakes Take the Cake’s birthday. 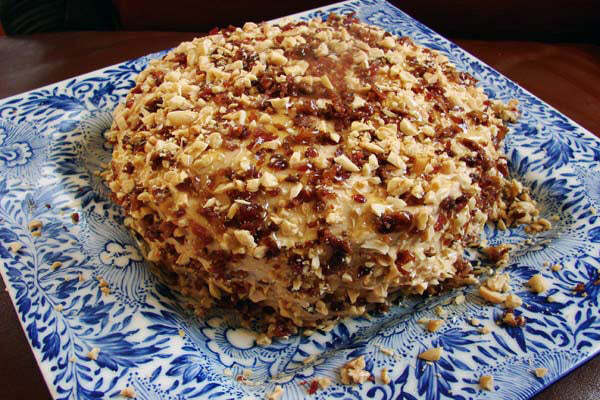 I created a moist banana cake and topped it with a nice peanut butter buttercream frosting and plenty of candied bacon “sprinkles.” Since then I’ve improved upon the recipe and adapted it into a truly decadent banana triple layer cake made with bourbon, fried bananas, plenty of those bacon sprinkles and chopped peanuts. Warning: this cake is habit forming. 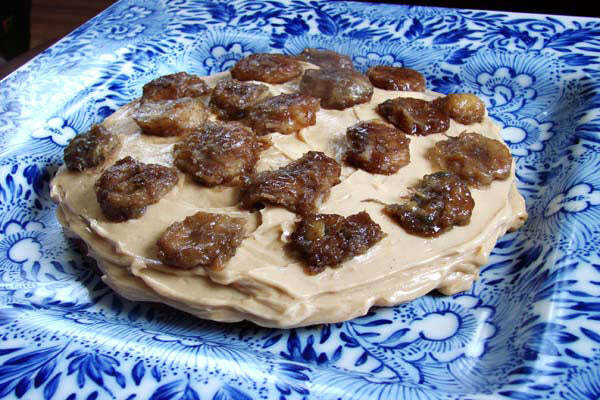 Serve with a glass of cold milk (or a shot of stiff bourbon) and enjoy with your favorite Elvis album. Happy Birthday to the King! 1. 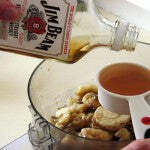 In a medium bowl mix melted butter, mashed bananas, eggs, vanilla and bourbon. Set aside to let flavors steep for at least half an hour. 2. Preheat oven to 350°F. Grease and flour three 8-inch cake pans and set aside. 3. In a large bowl, whisk flour with the sugars, baking powder, baking soda, cinnamon and salt. 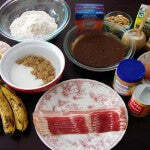 Fold wet banana mixture into the flour mixture until all ingredients are moistened. Be careful not to over mix. Divide and pour cake batter into greased and floured cake pans. Bake cakes 20 to 25 minutes in the center of the oven or until a toothpick inserted into middle of the cakes comes out clean. 4. Cool cakes in the pan for 5 minutes then invert and remove from pan to cool completely on wire racks. 1. 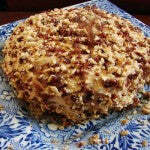 Set aside chopped peanuts and additional honey for use during cake assembly. 2. Arrange bacon slices in a single layer on the bottom of a large cast iron skillet. Cooking in batches over medium heat, fry bacon until it’s just done making sure that bacon is not too crisp. 3. Use tongs to remove bacon from pan and place on a paper towel covered plate. Blot bacon with paper towel to remove excess grease. 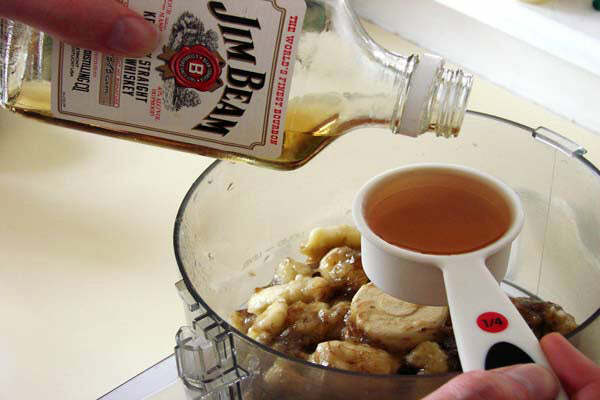 Drain all but two tablespoons excess grease from frying pan and add brown sugar and bourbon. 4. Return pan to medium-low heat. 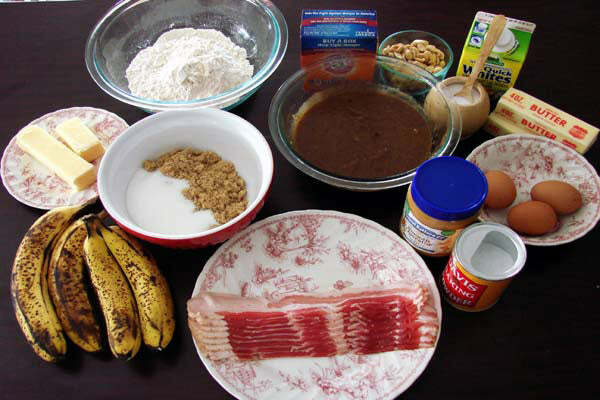 When mixture begins to bubble slightly toss in bacon and coat with sugar mixture. Drizzle coated bacon with honey and cook until bacon achieves a candy sheen. Remove bacon from pan with tongs and place bacon pieces on a cutting board to cool. 5. Reserve liquid in pan. Once bacon has completely cooled, chop into “bacon bits” and set aside. 1. 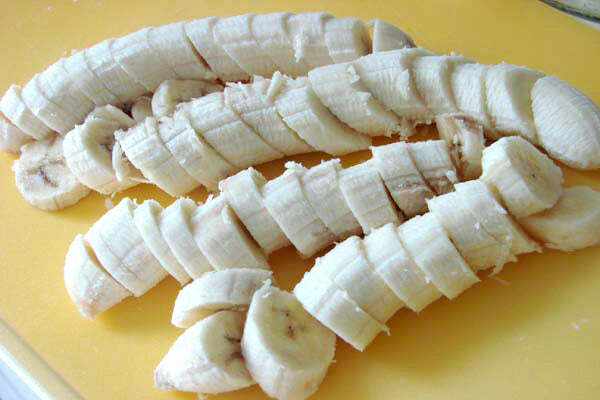 Slice bananas crosswise into medallions of approximately the same size. 2. In a large cast iron skillet, heat reserved bacon grease mixture over medium low heat with bourbon. 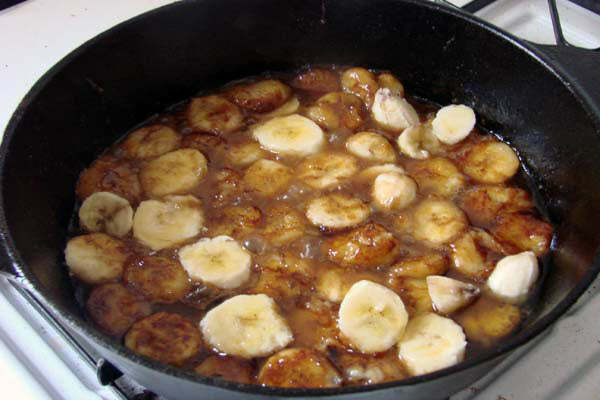 When mixture begins to bubble slightly use tongs to add bananas in a single layer to the pan. 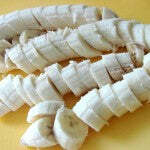 Cook for bananas for several minutes each side until bananas are completely coated and slightly softened. 3. 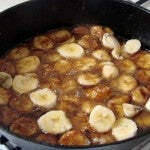 Use tongs to carefully remove bananas from the pan and cool completely on a large plate. 1. 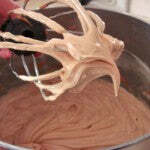 Whisk sugar and egg whites together in a large heatproof bowl or the bowl of a double boiler. Place the bowl over a pan of simmering water, the bowl should be a snug fit with the pan. 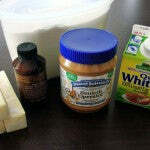 Whisk the mixture constantly until the sugar has dissolved and the mixture is hot to the touch, approximately 3 minutes. 2. 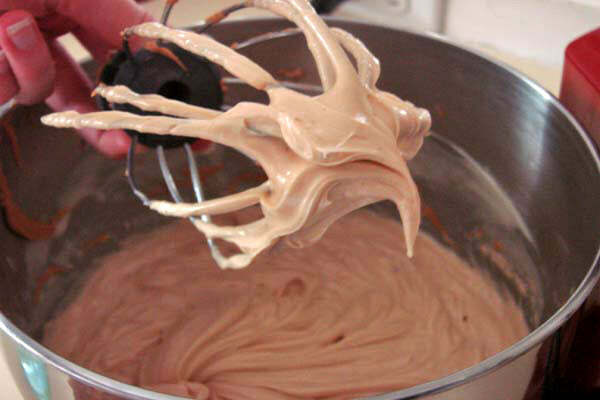 Using the whisk attachment on a stand mixer, beat the egg white and sugar mixture at medium speed until it is cool and milky white in color, approximately 5 minutes. 3. Switch to the paddle attachment and add the butter to your mixture one stick at a time. Beat until smooth between each addition. Once you’ve added all of the butter, beat the buttercream on medium-high speed until it is thick and smooth, 6-10 minutes. 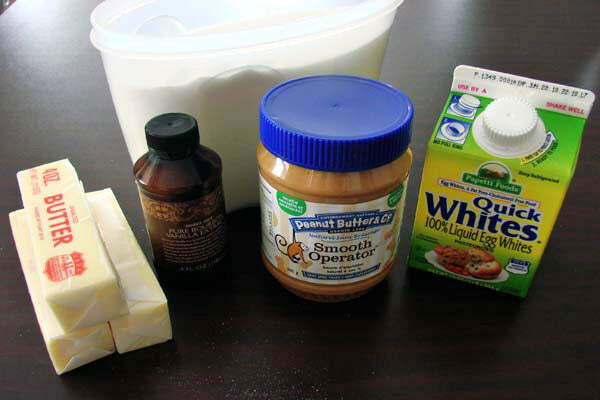 Once buttercream has reached a thickened state add in vanilla extract then add the Smooth Operator ¼ cup at a time. 4. If you aren’t ready to use the buttercream immediately, place it in the refrigerator with a piece of plastic wrap pressed firmly against it. Refrigerated buttercream will be too firm to spread, so you’ll need to get it up to room temperature then beat by hand before attempting to spread. Do not try to beat it buttercream right out of the refrigerator — otherwise your buttercream will separate. You can freeze any extra buttercream to use later. 1. 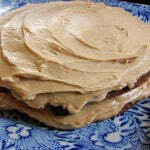 Place first cake layer on your serving plate or platter. 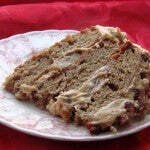 Spread cake generously with buttercream and layer with half of the fried bananas. Buttercream is very heat sensitive, so if you are preparing this in a warm kitchen or during warm months, you may want to refrigerate between assembling each layer for 20 minutes or until frosting is set to prevent any sliding. 2. 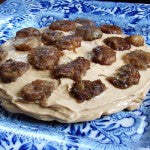 Add the second cake layer on top of the first and spread generously with buttercream and layer with the remaining fried bananas. 3. Add the final cake layer and spread generously with buttercream. Use remaining buttercream to completely frost the sides. 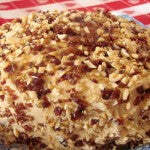 Top cake with bacon sprinkles, chopped peanuts and drizzle with honey. 4. Store leftover cake completely covered in the refrigerator. 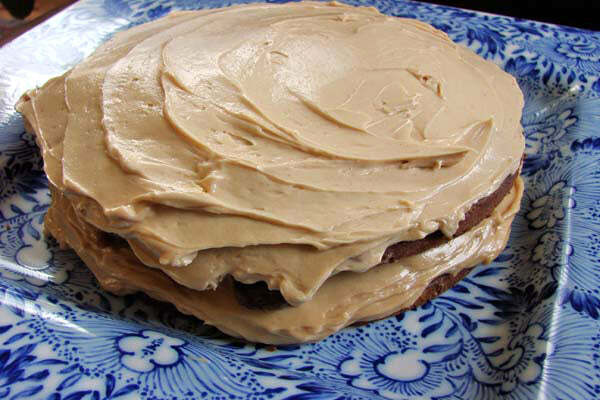 The post Triple Layer Elvis Birthday Cake with Peanut Butter Buttercream appeared first on - Peanut Butter & Co. Recipe Blog.